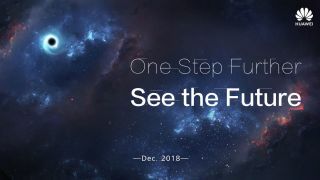 2018 may be almost over, but it appears Huawei isn't done with phone launches this year as the Chinese firm has just sent around a teasing invite. There's not too much to go on, with the words "one step further, see the future" and the vague date of 'Dec 2018' all that's offered up. Or is it? The words are set against a night's sky, but there's one particularly distinct feature in the top left corner - a black hole. This could hint at the inclusion of a pinhole camera on the front of the device, which would see the display wrap entirely round the snapper, rather than it appearing in a notch that cuts into the screen. 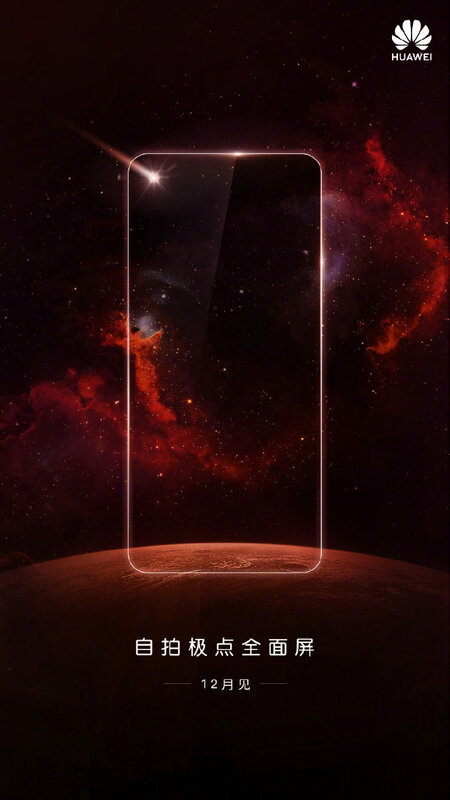 Just two days previously, Huawei posted a poster on Chinese micro-blogging site Weibo showing the outline of a phone with a similar graphic in the corner, hinting more obviously at the potential of a pinhole camera design. It arrived alongside the message "a 'point' surprise, see you in December!" (translated from Chinese). If this turns out to be true, Huawei would beat Samsung to the punch, with the Galaxy S10 heavily rumored to adopt a similar design in an effort to avoid a 'notch' after it debuted its Infinity-O display at its recent developer conference. There's no word on what the phone being teased by Huawei will be called, although some of the speculation we've seen online suggests it may be a new addition to the firm's mid-range Nova line. That would be slightly surprising given the screen tech it'll supposedly be packing, but for know we'll have to sit back and wait for the December launch.